Gluten, Wheat and Nut Free with NO artificial colourings, ingredients, perfumes, petroleums or preservatives. Are you an Aromatherapist in Practice? I'm very happy with this product. I have a difficult time keeping moisture in my hair. 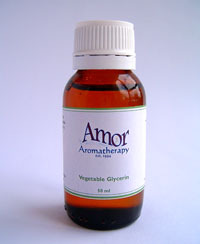 The glycerin locks the moisture in my hair, keeps dryness away and makes my hair extremely soft. In addition, I use it in my homemade sugar scrub. Overall, the quality of the product is amazing and the fact that it came in an amber glass bottle, instead of a cheap plastic one, is the icing on the cake. Copyright © 2019 Amor Aromatherapy Ltd. Powered by Zen Cart. Zen cart ecommerce design by Picaflor Azul.